Here is another one that warrants full disclosure. This is an another favorite of mine. Like the O’Hara’s Irish Red I had this few years ago at an Irish Beer Tasting and really liked it. This was not as good as the Celebration stout but was a nice Irish Dry Stout. I have since bought it several times and loosely refer to it as my gold standard for a good Irish Dry Stout. So let’s give it a whirl on this St. Pattie’s Day. The beer pours a dark brown completely opaque with no light showing through the glass. It also has a fairly rich tan head. The head started out very rich and creamy but as it set the bubbles grew larger and larger. It is still there but has diminished quite a bit. The nose is full of those classic sweet dark roasted malts with a light hop aroma. This is a classic Irish Dry Stout aroma. Wow, what a nice St. Patties treat. 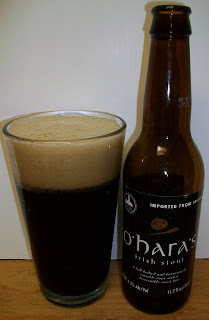 I started the night with the O’Hara’s Irish Red and now their Irish Dry Stout. So I guess I should describe the taste of this wonderful stout. Of course it starts out with sweet rich dark roasted malts upfront then a fairly dry but smooth mouthfeel in the mid-sip. The back-end has a building malt bitterness and then fades to a nice clean dry hop stout finish. The final aftertaste is that of lingering classic roasted malt flavors. It is fairly dry so you don’t have that thick coating of a cream stout. There is a good deal of hop bitterness to the back-end and finish of this beer. That is what gives a Dry Irish Stout it classic appeal. And this (in my humble opinion) is the best of the best for a dry stout. If you like a dry stout like Guinness than you will love this stout. It is far superior to other dry stouts that I have had. It is also warming nicely; it is really getting smoother as it warms. Well, I guess its official this is my gold standard for an Irish Dry Stout, a solid A for this one.